SANTA MONICA, Calif. (October 2, 2018) – With a seemingly endless summer, autumn is an exciting time to visit the beachside city of Santa Monica. As fall chills the rest of the country, Southern California’s average temperatures remain steady in the 70s. The warm climate, beautiful scenery and thinned-out crowds make this season an ideal time to visit. Read on for some of the ways the city by the sea comes alive this fall with incredible new eats, unique shops, hotel offerings, and cultural events and festivals to celebrate the harvest season. Élephante (Downtown Santa Monica) – Nick Mathers, the name behind The Eveleigh, Goldie’s and Little Ruby in Los Angeles, has opened an exclusive rooftop beach house with ocean views in Santa Monica, featuring a light menu of food items, an elevated cocktail and wine program and Instagram-worthy sunset views. Élephante aims to transport guests from LA to the Southern Mediterranean all whilst staying in the heart of Santa Monica. The menu offers coastal Italian favorites and the three bars on the property offer a variety of fun, approachable cocktails and a collection of natural wines. Esters Wine Shop & Bar (Mid-City) – Esters Wine Shop & Bar, a member of the Rustic Canyon Family of restaurants, has a new Executive Chef, Jessica Liu He. She has begun adding some heartier brunch dishes like made-to-order frittatas, shrimp & grits, chicken club sandwich and more to the weekend brunch menu. Esters has also introduced some new drink options to share with friends like tableside Mimosa Service, where for $28 you get a bottle of Prosecco with three, fresh-squeezed juices. LDH Kitchen The Robata (Mid-City) – Opening along Wilshire Boulevard, one of the most well-known streets in town, is LDH Kitchen’s The Robata. The restaurant, helmed by experienced chef Makoto Takano, features robatayi-format dining. Dubbed the first restaurant to marry Japanese cuisine with entertainment in Los Angeles, The Robata offers a daily light show that is projected on the walls and includes sound effects, sweeps and swirls of color, changing landscape images, and some trippy visuals. The menu combines seared meat and sides with options like fried chicken katsu cutlets, sushi rolls, and a full cocktail bar with a focus on sake. Mamacitas (Main St.) – Mamacitas, the new casual restaurant located on the ground level of The Victorian in Santa Monica, features contemporary Latin cuisine. The menu includes a variety of shared plates such as the Cusco Jar, Pork Belly Tacos, Shrimp Latkes and Vegetarian Empanadas. While enjoying the sounds of live music on Mamacitas’ serene outdoor patio, guests can sip on some of the city’s best classic cocktails such as an Old Fashioned, Margarita or Pisco Sour, or try a variety of Mojitos served at the bar including the Coconut, Strawberry Pineapple and Yuzu. Mamacitas is open for dinner Tuesday through Sunday as well as Sunday brunch. Massilia (Downtown Santa Monica) – A new all-day restaurant, Massilia, is bringing European flare to Downtown Santa Monica. Located on Fourth Street, the charming Mareseille-inspired brasserie is from Emmanuel Dossetti, the founder of Zinqué café – the French restaurant micro-chain. The menu features culinary influences from Italy, Spain, Morocco and the South of France with dishes like seven vegetable couscous, eight-hour braised lamb shank and pan seared calamari. Massilia features an open-air-patio and a full bar to go along with its cocktail and French wines list. Mélisse (Wilshire Blvd.) – Mélisse, the two Michelin-starred French-New American restaurant by chef Josiah Citrin, is celebrating 19 years in business with a special anniversary menu. Now through October guests can enjoy a six-course meal with options like egg caviar, California king salmon, or wild mushroom risotto for $99 per person. Situated on Wilshire Boulevard in Santa Monica, Mélisse inspires all of the senses with its chic ambiance, superb, contemporary cuisine and gracious service. The Moon Bar at Lunetta (Pico Blvd.) – After a fun day of surf and sun, when the tide begins to rise, and the moon makes its nightly arch, The Moon Bar at Lunetta opens its doors and welcomes guests to partake in an evening of chef-driven elevated new Californian cuisine and masterfully handcrafted cocktails. Presented by Chef Raphael Lunetta, The Moon Bar is tucked inside Lunetta Dining, capturing the atmospheric California coast quiescence with the approachability of an evening neighborhood cocktail bar. The Moon Bar at Lunetta is a new getaway in Santa Monica where you can sip a handcrafted cocktail by a fireplace, meet up with friends, or unwind with your own thoughts. Punta Cabras (Mid-City) – Punta Cabras, a modern Mexican restaurant, bar, and taqueria, has debuted a Baja-inspired brunch menu. Available on Sundays, the menu includes a combination of land and sea dishes like ceviche of the day, al pastor benedict, breakfast costra, cóctel del mar, and more. Pair the new brunch items with one of Punta Cabras refreshing brunch cocktail options such as: mimosa, bellini, sangria, bloody maria, and michelada. Sumo Dog (Downtown Santa Monica) – Sumo Dog, a the Japanese-inspired hot dog spot that caught waves at Coachella Music Festival, has opened a new location along the bustling Third Street Promenade. The work of chef and owner Jeffrey Lunak, this brick and mortar location features a chic, beach design with bamboo paneling and hanging lamps. The menu includes grilled hot dogs with Japanese toppings – furikake, keypie mayo, green onion, jalapeño, wasabi relish, and more. CycleBar (Downtown Santa Monica) – Indoor cycling enthusiasts now have a new beachside location to get their pedal on. CycleBar, the world’s first and only Premium Indoor CyclingTM franchise, has opened a studio on 2nd Street in Santa Monica. the 3,000 square foot space is home to 46 bikes and touts a library of 10,000 music videos. The Hydration Room (Montana Ave.) – The Hydration Room, a clinic that administers vitamin IV and injection therapies, has opened their 6th location along Montana Avenue. Specializing in naturopathic and allopathic medicine, The Hydration Room can help with an array of symptoms such as fatigue, stress, muscle recovery, chronic illnesses, jet lag and more. Every new patient that visits The Hydration Room will receive a free Vitamin B12 shot just for stopping by and checking out the state-of-the-art facility. North Beach Playground (Pier/Ocean Ave.) – There’s a new oceanside playground for families in search of sand-side fun at Santa Monica State Beach. The City of Santa Monica has opened the North Beach Playground, a universally accessible playground located north of the Santa Monica Pier along Pacific Coast Highway. The playground includes separate playing areas for children 2-5 years old and another for children 5-12 years old. The universally accessible design aims to inspires activity, mobility, and imagination in all children. The Ambrose Hotel (Mid-City) – The Ambrose Hotel, a boutique California craftsman-style hotel, has made extensive updates to their indoor and outdoor public spaces. The hotel engaged esteemed design duo Farouki Farouki for the project, enabling The Ambrose to create an oasis that draws inspiration from the rich architectural traditions and motifs of the Arts & Crafts movement. With a palette inspired by local flora, this redesign boasts the buildout of a beautiful bar, two outdoor courtyards, a new lobby, reception and library space. A reflection of the thriving art mecca of the Los Angeles area, these refreshed spaces aim to be an urban retreat for guests and locals as well as offer an idyllic location for intimate events and meetings. Shutters on the Beach Hotel (Pico Blvd.) 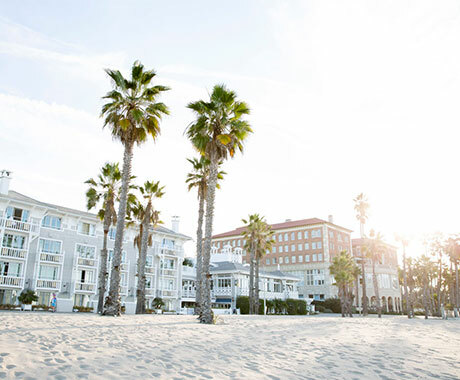 – The luxury seaside Shutters on the Beach Hotel, has debuted a new line of ultra-luxury facials at its celebrated ONE Spa in partnership with premier skincare brand, Biologique Recherche, pairing the skincare company’s personalized approach with ONE Spa’s sought-after estheticians and seaside setting. Four specialized treatments are tailored to target the unique needs of each guest, gently improving the skin’s balance and hydration. Viceroy Santa Monica (Pier/Ocean Ave.) – Viceroy Santa Monica has appointed Sean Piccarreto as the new chef de cuisine of the landmark property which has defined Santa Monica for almost two decades. Chef Piccarreto brings over 17 years of experience to the kitchen at Viceroy Santa Monica, guiding the hotel’s Cast Restaurant, Cast Lounge, in-room dining, and special event offerings. His refined style of Mediterranean cuisine is showcased across all menus with many ingredients sourced from the local farmers markets. Viceroy Santa Monica has also launched a daily happy hour named VICE HOUR, which includes 50% off the menu at the Cast lounge from 5 p.m. to 7 p.m. Twilight on the Pier (Pier/Ocean Ave.) – The premier Southern California free outdoor concert experience is back with a new name, new season and new vision. Twilight on the Pier returns for the 34th year this fall, running September 5 through October 7. Twilight on the Pier will spotlight unique artists from around the world – a truly local meets global experience. Each night of the series will be a Pier-wide festival, complete with immersive art, food offerings, a beer and spirits garden, games and interactive activations all along the Pier promenade. COAST: Open Streets Festival (Downtown Santa Monica) – COAST, the City of Santa Monica’s open streets event, returns this autumn. Bike, bus, train or walk your way to a free, engaging and fun way to explore the city on October 7. Two miles of car-free streets will host local food, music, shops, culture, dance and games along with immersive art instillations that include a participatory thumbprint mural and a 30-foot plastic bottle and giant plastic straw. Later in the evening, stop by the Santa Monica Pier for the finale of Twilight on the Pier, the free outdoor concert series. Farmers’ Markets Fall Events (Santa Monica) – Santa Monica’s four weekly farmers markets are offering special events to celebrate the harvest season. On October 21, the Main Street Farmers Market will host a no-carve pumpkin decorating event for children. Then on October 24, the Wednesday Downtown Santa Monica Farmers Market brings back the annual “all you can carry pumpkin patch” in which you get to keep as many pumpkins as you can hold, all for one low price. Front Porch Cinema (Pier/Ocean Ave.) – Pull up a lawn chair, an extra-warm blanket and unwind on Southern California’s front porch with free films after dark at the Santa Monica Pier from October 18 through October 21. Expect food vendors, cocktails, and the occasional special guest. The series kicks off the season with a screening of Grease followed by Clueless, The Addams Family, and Coco. Get in the Halloween spirit and come dressed as your favorite character from one of the featured films. Off the Hook Seafood Festival (Pier/Ocean Ave.) – Celebrate the sea at the 4th annual Off the Hook Seafood Festival on the iconic Santa Monica Pier on October 6. This 21+ foodie fundraising event will include seafood tastings from some of the city’s top restaurants, live music, beer garden, an oyster shucking competition, and VIP lounge. The festival will highlight Santa Monica’s unrivaled seafood offerings while helping raise awareness for the sustainable seafood movement. Femelle (Montana Ave.) – Independently owned Femelle has opened along tree-lined Montana Avenue in Santa Monica. At Femelle you’ll find a timeless selection of classic ready-to-wear pieces for women, as well as staple items like premium denim and t-shirts. A curated collection of both Los Angeles based, and international brands will help women to upgrade their wardrobe with high-quality and unique clothing items designed to be both feminine and functional. Main Street Rewards Loyalty Program (Main St.) – Get rewarded for being a loyal shopper and enjoy exclusive perks from over 50 Main Street businesses when you purchase a Rewards Card. The newly launched program offers card holders deals at restaurants, bars, cafes, clothing stores, and other retail and service businesses along Main Street. Cards are available for purchase online and at the Main Street booth, during the Sunday Farmers Market in Santa Monica. UNTUCKit (Downtown Santa Monica) – UNTUCKit, the American casual men’s apparel company, has opened in Santa Monica Place. UNTUCKit specializes in shirts that are meant to be worn untucked. Created with a shorter hemline, UNTUCKit’s shirts are designed to fall at the perfect length every time. A design fit for comfort, not convention. UNTUCKit offers dress shirts, polos, t-shirts, sports jackets performance wear, and lines for women and boys. Visitor Guide and Map Photography Cover Contest (Santa Monica) – Santa Monica Travel & Tourism (SMTT) has launched a Visitor Guide and Map Photography Cover Contest to find the picture that tells the Santa Monica story – an unforgettable beach city experience filled with eye-catching people, cutting-edge culture, and bold innovations. The winning photograph will be featured on the front cover of the 2019/20 Santa Monica Official Visitors Guide and Santa Monica Official Visitors Map with photographer credit, and featured in a blog post on santamonica.com. The winner will also receive a two-night stay at a Santa Monica hotel. The contest will run from September 24, 2018 to December 31, 2018. Morgan-Wixson Theatre (Pico Blvd.) – Santa Monica’s Morgan-Wixson Theatre is the oldest theatrical organization in the city, founded in 1946. This fall season, Morgan-Wixson Theatre is presenting She Loves Me, a classical musical comedy perfect for families looking to enjoy an evening at the theatre. A captivating jewel-box of a musical, She Loves Me radiates pure romance through some of the most iconic numbers in musical theatre, including “Vanilla Ice Cream,” “Tonight at 8” and the title song. The play will run September 22, 2018 through October 14, 2018. Starline Tours (Santa Monica) – Starline Tours, the largest tour company in Los Angeles, has launched a new shuttle service to the Getty Villa, one of two locations of the J. Paul Getty Museum. The shuttle runs daily – except Tuesdays – picking up at four Santa Monica hotels including Viceroy Santa Monica, Shore Hotel, The Georgian and Fairmont Miramar Hotel & Bungalows. Guest can purchase tickets at any Starline Tours locations or pay directly aboard the shuttle. Each ticket is valid for the day and can be used to go to any stops along the route including Venice, Marina del Rey, Santa Monica, and Pacific Palisades. 18th Street Arts Center (Mid-City) – 18th Street Arts Center, a nonprofit arts center offering one of the top 20 artist residency programs in the U.S., is welcoming Neha Choksi for a year-long performance beginning this fall titled Elementary. Elementary is part of Choksi’s larger Play!School! project that questions childhood as a limited category and extends childhood’s epistemic processes to foster new understandings about how we organize and address contemporary civil society. In addition, 18th Street Arts Center is hosting open studios with visiting artists in residence from Denmark, Germany, Korea, New York, New Zealand, Oregon, Russia, Sweden, Taiwan, and the UK. 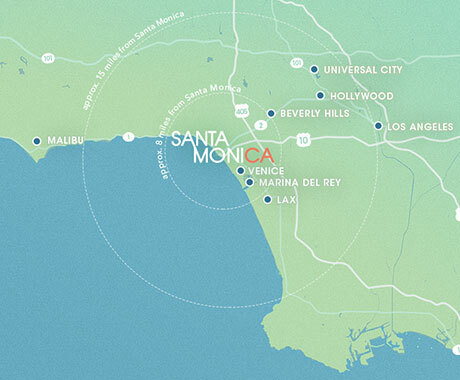 Santa Monica Travel & Tourism (SMTT), formerly Santa Monica Convention & Visitors Bureau, is a non-profit organization designed to increase visitor expenditures, tourism revenues and local employment opportunities through the promotion of Santa Monica as a travel destination. For travel and accommodation information or a free copy of the official Visitors Guide, the public can write to the Santa Monica Visitor Center, 2427 Main Street, Santa Monica, CA 90405; call (800) 544-5319 or (310) 393-7593; visit www.santamonica.com; or email info@santamonica.com. Follow SMTT on Instagram (@SeeSantaMonica), Twitter (@GoSantaMonica), or Facebook (www.facebook.com/visitsantamonica).